Backed by rich industry experience and market understanding, we are involved in offering a wide array of Black Croco Print Leather Jalsa to our valued patrons. This amazing pair of Jalsa Jutti boasts of a stylish appearance, while not leaving comfort behind. 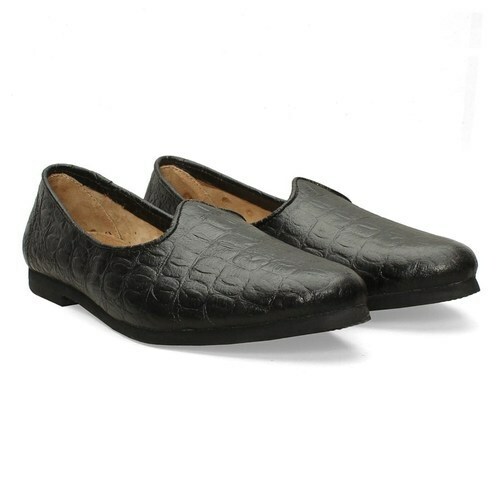 They are made from 100% Genuine Leather with comfortable foot-bed and smooth outsole. Team it with trousers or traditional attire, for an ideal look. Incepted in the year 2012, we “The Vogue Global” are engaged in manufacturing a wide assortment of Biker Jackets, Office Bags, Sneakers Shoes, Tassel Shoes, Womens Jackets, etc. Situated at Jalandhar (Punjab, India), we are a Partnership company and manufacture these products as per the set industry standards. We provide these products at reasonable prices and deliver these within the assured time-frame. Managed under the headship of our mentor "Mr. Sabjit Singh Bhatia", we have achieved a significant position in this sector.